Waller said: "Going past the straight the first time, I was a bit concerned she was three wide, but it all unfolded very well. She got cover and the pace wasn't too strong. She only really performs under pressure, so that was my only concern. "To see her unleash as she does, I was looking for Humidor coming off the back and seeing how the others were travelling, but she had them covered a long way from home. "It's indescribable. 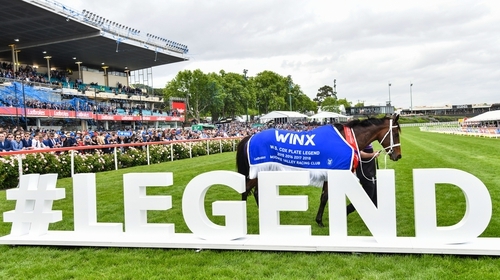 (My team) all do great jobs, particularly Winx. With the media and the fans, it's just gone to a whole new level. We're not trained to deal with it, but thanks to everybody. She said: "It's surreal really - four Cox Plates, how do you describe that? It's never been done and this mighty mare, she raced so well. "Benbatl was there, we've beat the overseas horses and I thank them from the bottom of my heart for coming over. "She's shown the talent she has - what a horse." Benbatl's trainer Saeed bin Suroor felt his charge had simply been beaten by a better horse. He said: "She's a superstar - the best of the best. I'm very happy for her owners, trainer and jockey. It was a great race, we took our chance but our horse was beaten by a better filly. "He ran well, but she's something special." Murphy echoed those sentiments, adding: "It was a big run, we've met a champion in Winx and she was impressive today. Full credit to her team." Rostropovich eventually finished fifth and Moore said: "He's ran a nice race, a lot of hard work, but the winner is a champion."